This article is about the place. For the quest, see The Desolate Mine. 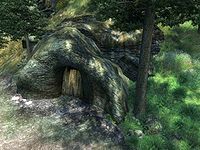 Desolate Mine is a small mine northwest of Cheydinhal containing goblins (quest-related). It contains only one zone, Desolate Mine. You can enter this mine before the related quest but door H will be locked (key required). This mine contains 5 Cairn Bolete plants and 39 Wisp Stalk plants. The goblins both in and outside this mine will commonly be fighting each other. With patience, this can make this quest much easier. Every time you get released from any jail, the three Fighters Guild members (if they survived) will show up right behind you. This bug is fixed by version 1.0 of the Unofficial Oblivion Patch. 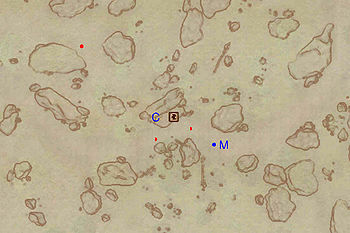 This location's map marker (M on map) is named Desolate Mine (editor name DesolateMineMapMarker). The entrance door is NW of the marker, 60 feet away. 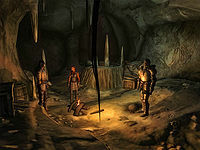 After initiating the related quest, you will meet the three Fighters Guild members Brag gro-Bharg, Elidor, and Rienna around a campfire (C). 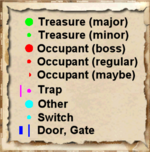 There is a hallway to your right, but it leads to a locked door (H) which can only be unlocked with the Mine Key. The three fighters each possess the key and will unlock the gate when the goblin hunting starts. You can always pickpocket them and unlock the gate anyway. When the fight starts, stick around the three fighters. Try to protect them, because if all of them survive you will get a much greater reward. Beware of the Falling Log trap at D , because the trap is lethal to the fighters. You might want to reach it first and spring the trap by breaking the tripwire (E) to protect your guildmates. If the door at H is unlocked, you should go left at the end of the hallway. To your right is a dead end, and there are two goblins to slay in the room to your left. At the other end of this room, you should go left (1 goblin and some treasure) or right (3 goblins). The Fighters Guild Members tend to go right, so that's the path to take. When this room is cleared, take the hallway in the northern corner; this will allow you to spring the falling log trap (D). 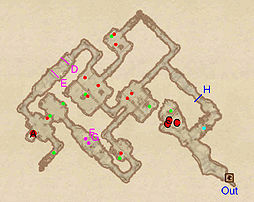 The room with three goblins has another exit to the north, leading to a room with two goblins. The corridor with the falling log trap leads to the boss-leveled Savage Goblin and another goblin. If you killed those and the three Fighters Guild members are alive, you can safely loot all the chambers of this mine. Watch out for the Swinging Mace trap at F, it is located between two fences.